Whatever you’re trying to sell — one skill you definitely need is a super elevator pitch. You need to prepare for any opportunities. Don’t be caught off guard. Create an introduction describing the value you provide, be concise, customize it for your target audience, and really know it – so you can deliver a flawless elevator pitch. To stand out in a crowd, you have to be prepared to push their buttons — by quickly answering the basic marketing 101 “so what” question. That’s what all prospects subconsciously ask themselves. 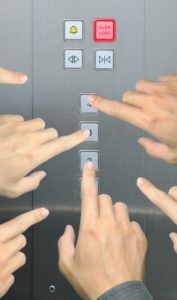 So that’s the purpose of an elevator pitch – whether telephoning a prospect to seek a formal appointment, or when actually riding an elevator when you suddenly come face-to-face with a key decision-maker. 1. Know your talents. Take an hour or two to analyze and write down your strengths. 2. Forge a benefit statement or value proposition for each of you or your company’s strengths – a minimum of five reasons to buy from you. Then develop a succinct overall summary – less than 10 seconds – of the value you provide. Set the table so you get another 60 seconds of dialogue – you’ll want a green light that shows the prospect wants to hear more. 3. Avoid trite, over-used buzz words (The Best and Worst Business Buzzwords, Jargon, and Cliches). 4. If you mention data or statistics, keep it simple. Very simple. 5. Rehearse your pitch but don’t appear robotic or wooded, as we broadcasters used to say. You want to have a natural, smooth presentation. How you introduce yourself is just as important as what you say. 6. Keep your branding fresh and up-to-date for the changing marketplace. 7. Be flexible. Be prepared to switch gears if your prospect divulges valuable information regarding a need you think you can fill. It’s all about problems and solutions. 8. Don’t focus on giving your ideas to the prospect. Focus on your value. 9. Do your best to have a presence in the room before your pitch. In other words, develop a strong image online and in the community. That will enhance your chances in making your pitch. 10. Watch for cues to listen. The most persuasive people talk 10 percent of the time and listen 90 percent. If the prospect says something, treat like it’s an event for you and listen intently. 11. If you get an objection, be sure to respond effectively. Overcome the objection with facts. Job Hunting? Tips to Land Your Dream Job with Style, Substance— Yes, the competition for jobs is ferocious. Here are proven tips to be hired for your dream job. Want More Revenue? Avoid the 7 Deadly Sins of Selling — Whether you are an established company or a startup, what you probably need most in this economic climate is a positive revenue stream. It’s possible with a higher-performing sales staff. The Seven Steps to Higher Sales — Secrets for sales success – seven steps to higher sales, five value perceptions that motivate customers to buy, and the three-step process for overcoming sales objections. You Can Get Bigger Corporate Accounts in 5 Steps — So your company needs to grow and you’ve decided to go after bigger fish. Getting bigger corporate accounts is easier, if you develop the right system. But not only must you have reason to be confident, you must position yourself and your company to instill confidence in your prospects. The Lost Art – How and Why to Use Cold-Calling for Higher Sales — Are you lacking in sales? Do you get enough face time with the right prospects? Here’s how and why in-person cold calls will help you make sales. Classic Red Flags You’re about to Lose a Sale – How to Save It — You’ve done your research about a prospective client, and you’re making a sales presentation. Here are red flags indicating you might lose the sale.